External funding for UNL research continued to set records this year, topping $100 million, according to the Office of Research and Graduate Studies. 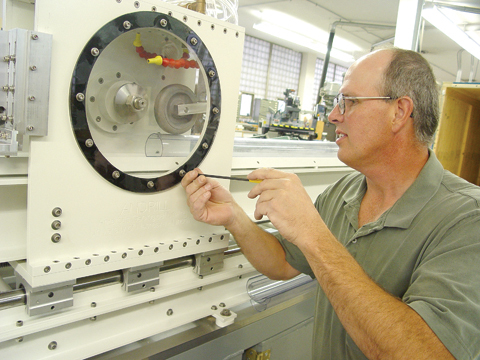 SPLIT DESIGNER - Michael Jensen, manager of the Chemistry/Physics and Astronomy Instrument Shop, tightens a protective shield onto the ANDRILL core splitter he designed for the five-nation, UNL-led geological drilling program based in Antarctica. Jensen, a UNL graduate, spent over 500 hours on the design and build of the core splitter. Photo by Troy Fedderson/University Communications. Michael Jensen has no desire to follow his newest research-related creation into the field. Summer construction has eliminated the 14th Street railroad crossing as a reason for campus tardiness. A transition to a new version of the UNL Web site was launched Aug. 14. U.S. Ambassador to the United Nations John R. Bolton will lead off the 2006-07 E.N. Thompson Forum on World Issues at UNL with a lecture 3:30 p.m. Sept. 8 at the Lied Center for Performing Arts. Tickets will be distributed free for the lecture beginning Aug. 28. Campus residence halls are filled beyond capacity for the first time in a number of years, prompting UNL Housing officials to house students in temporary rooms. Back-to-campus time will again see thousands of students moving in to residence halls this week. Faculty, staff, visitors and Lincoln residents should be aware of minor traffic delays in the City Campus vicinity because of closing of lanes and some congestion from move-in traffic, in addition to changing traffic patterns from the ongoing Antelope Valley construction. Construction, rider opinions and parking improvements have prompted Parking and Transit Services to update City Campus bus routes. Ceramics students have added a splash of color to the Selleck Hall dining facility. When officials in the United Kingdom uncovered a possible terrorist plot Aug. 10, the 70 UNL Nebraska at Oxford students were preparing for final exams and readying for the return trip to the United States. The Nebraska Sandhills is a region of gently rolling sand dunes blanketed with prairie grasses and wetlands, covering a quarter of the state and providing ideal habitat for wildlife and livestock. A sculpture gift from Germany will be celebrated in "Coming Home," a Sheldon Memorial Art Gallery exhibition opening Aug. 22. Landscape architect Richard Sutton deals in images. The images of three photographers will open the new exhibition schedule for the EisentragerHoward Gallery in Richards Hall. A coming-of-age tale by first-time director Michael Kang opens Aug. 18 at the Mary Riepma Ross Media Arts Center. Event tickets for the Lied Center for Performing Arts' 2006-2007 season are available for purchase. A chronological tour of American art, from the early 19th century through today, is presented in the six revamped permanent collection galleries of the Sheldon Memorial Art Gallery. Pete Pinnel, professor of art, is curator of "The Art of the Teapot," an exhibition opening Sept. 1 at the Lux Center for the Arts. William Carlos Williams, one of our country's most influential poets and a New Jersey physician, taught us to celebrate daily life. Here Albert Garcia offers us the simple pleasures and modest mysteries of a single summer day.